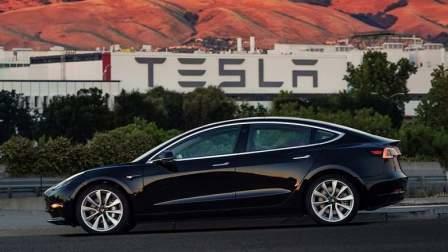 Leading electric vehicle giant Tesla on Wednesday inaugurated its first showroom and service centre in the Middle East on the Sheikh Zayed Road in Dubai, but fans of the green cars will have to wait until the New Year to receive the company's popular Model 3 first car in the region. The US-based company showcased its wide range of cars, including the latest Model 3 that costs around Dh110,000 and considered first mass market electric vehicle. Prices for Model S and Model X will start from Dh281,350 and Dh332,500, respectively. The interested buyers will also have to pay a deposit of Dh4,000 for Model 3. The new 17,000 square feet store and service centre, which is located opposite to the Burj Khalifa and The Dubai Mall Metro Station, will offer local maintenance for the small number of local owners of Tesla cars across the UAE. With both award-winning, all-electric Model S and Model X on show, the store will also include the Tesla design studio and the dual motor Model S rolling chassis. More than 3 million people worldwide visit Tesla retail stores every year to learn about electric vehicle technology in a low-pressure, educational environment. Tesla announced its arrival in both the UAE and Jordan earlier this year, inviting customers to visit the online design studio and order the Tesla vehicle that best suits their lifestyle. First orders of Model S and Model X vehicles already arrived in the UAE in June 2017. With two Supercharger sites in the UAE and three more planned by the end of the year - allowing drivers to recharge their vehicles in minutes rather than hours - Tesla also has 32 Destination Charging locations now available, with at least 18 more operational in the next six months. With an industry-leading NEDC range of up to 632km, Tesla's award-winning Model S is designed from the ground up to be the safest, most exhilarating car on the road. Model S delivers unparalleled performance through Tesla's unique, all-electric powertrain and accelerates from zero to 100 kmph in just 2.7 seconds. Model X is the safest, fastest and most capable SUV on the road. With standard all-wheel drive and up to 565km of range (NEDC) on a single charge, Model X fits an active lifestyle and includes ample seating for seven adults and all of their gear. Model X is incredibly fast, accelerating from zero to 100kmph as quickly as 3.1 seconds.